Toronto, March 22: Turkey’s President Recep Tayyip Erdogan has used the Christchurch Mosque Attack video at least eight times at poll rallies across the country to garner support for his political party for upcoming local elections. The video is being used by the right-leaning president to target his secular opposition leaders as well as Western countries such as the U.S., Australia and New Zealand. The video has been edited to draw parallels between Christchurch terrorist Brenton Tarrant’s manifesto and the words espoused by Erdogan’s opposition to paint the picture of a Turkey that is being betrayed by its political parties. Erdogan compared his opponent Kemal Kilicdaroglu to far-right Australian senator Fraser Anning, who drew criticism for blaming the New Zealand mosque attacks on Muslim immigration. 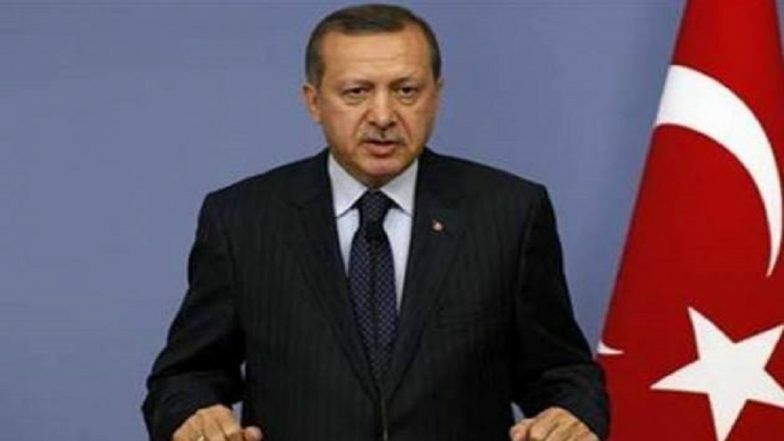 After the video plays out at each of his rallies, Erdogan is heard promising his audience that he will extract retribution for the Christchurch massacre in which 50 worshippers at two mosques were killed. “You will pay for this. If New Zealand doesn't make you, we will," he alludes to the Christchurch terrorist, before urging New Zealand to reinstate the death penalty. "This is not an isolated event, it's something more organised," after which Erdogan accuses the West of "preparing" the killer's manifesto and "handing it to him". Tarrant’s "manifesto" which runs to 74-pages mentions Turkey and the minarets of Istanbul's Hagia Sophia museum, which was once a church before being conquered and converted into a mosque during the Ottoman empire. Erdogan is also using the video to portray himself as the leader of the Muslim world as well as reclaim Turkey’s historical position of power as the seat of the Ottoman Empire. The New Zealand government has also reached out to social media platforms to pull down copies of the attack which was streamed live on Facebook. Facebook said that it taken down over 1.5 million copies of the video of the attack on two mosques in Christchurch.